Risk management may seem simple enough in theory, yet many employees still don’t have the necessary skills and competencies to successfully apply it in practice. One of the key components in building risk management skills is no doubt employee training and development. A 24X7 Learning survey revealed that only 12% of learners say they apply the skills from the training they receive to their job (report by 24×7 Learning: “Workplace Learning – 2015”. September 2015). According to a 2015 ATD research study, only 38% of managers believe that their learning programs meet their learner’s needs. One out of every three employees say that uninspiring content is a barrier to their learning (Embracing change/towards maturity 2015-2016 industry benchmark report). Only 25% of training programs measurably improve business performance (McKinsey Quarterly 2010). Humans forget 40% of what they’ve learned after 20 minutes and 64% after just 9 hours (H.Ebbinghaus, A contribution to Experimental Psychology, 1885). The findings from various studies, while inconclusive, suggest that training while very important, it alone is unlikely to be the turning point in building a strong risk management culture. I discuss other tools / techniques to build risk culture in this article: www.risk-academy.ru/en/building-risk-culture. Include risk management requirements in all relevant job descriptions when hiring new personnel for the organisation. Work with HR to streamline the process. Tone at the top is very important for risk culture development. Executives and Board members play a vital role in driving the risk management agenda. Nowadays many executives and Board members have a basic understanding of risk management. Auditors, risk management professional associations and regulators have been quite influential in shaping the Board’s perception of risk management. Unfortunately, not all the messages communicated by the auditors and regulators are sound and some are downright wrong. For example, one of the government agencies in Russia published a guidance document that encourages companies to have a standalone risk management process which in many ways contradict the core principles of ISO31000:2009. It is important for the risk manager to take the lead on forming the Boards and senior managements view on risk management by providing risk awareness sessions and relevant information. Make risk management training less about risk assessments and more about risk-based decision making, planning, budgeting and investment management. Don’t teach management how to manage risks, teach them how to do their job with risks in mind. 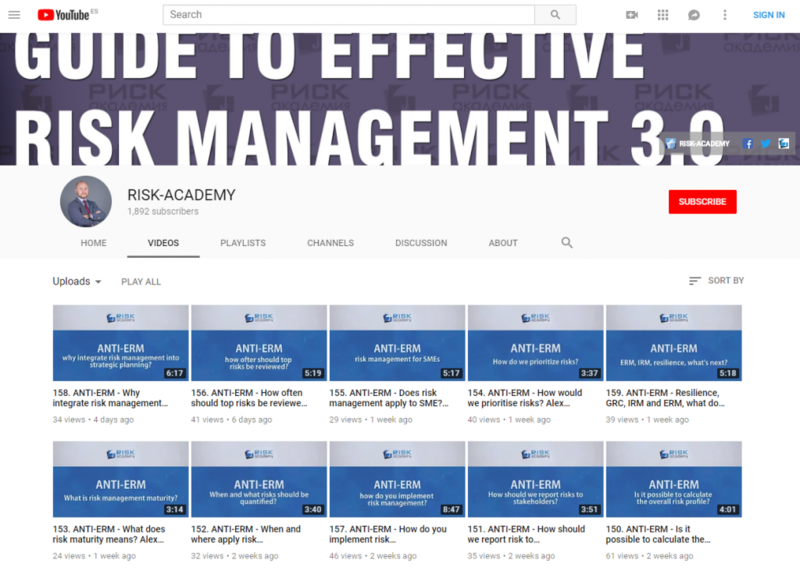 Record all risk management training sessions on video and make videos available on corporate intranet. Send employees annual or quarterly reminders to watch videos as a risk management refresher. Provide additional risk management training to the in-house risk management team and business units responsible for internal control, audit, finance, strategy and others. Risk managers may conduct it personally or outsource to third party providers. In-depth risk management training should include: risk psychology and risk perception basic, risk culture, ISO 31000, risk management and decision making foundations, integration of risk management into core business processes and decisions. Make all risk management training competency based and set KPIs to check for noticeable improvement in the quality of risk based decision making. Each training session should start and end with competency tests. Surveys should also be conducted one month and six months after the training to test for knowledge retention. Make sure that risk management information is available to employees, contractors and visitors. Place Risk Management Policy on the intranet and the corporate website, record and publish risk management training or awareness sessions videos on the dedicated risk management intranet page. Invite guest speakers (risk managers from other companies) to speak at the Audit Committee or Risk Management Committee and give all employees the opportunity to participate. I have used this in the past and it worked very well. Periodically post useful risk management related articles and research papers on the corporate intranet. Make the risk management information easily accessible to staff. Next: Next post: What is the role of modern day risk manager?